Seventy-four years ago, near the end of WWII, with Allied forces advancing from the west and the Soviet Red Army advancing from the east, the Nazis began a series of forced marches of prisoners out of their prisoner of war camps. There is no definitive answer as to why the prisoners were marched from the camps or what the Nazis planned for them in the end. One theory is that the prisoners were marched out of the camps simply to delay their liberation. By the end of January 1945, the plan to march allied prisoners out of Stalag Luft IV and away from liberation by the Soviet Red Army was ready to begin. The winter of 1945 was one of Germany’s coldest on record with blizzard conditions. The prisoners of Stalag Luft IV, the POW camp in which Dad was held prisoner, were ill-equipped for a march in such weather. They had been underfed and were not clothed properly for the conditions. On February 6, 1945 the march out of Stalag Luft IV began. With just a few hours notice to prepare to march out of the camp, the prisoners scrambled to gather what they could. The prisoners did not know where they were going or how long they would be on the road. The march out of Stalag Luft IV has been given many names – the Death March, the Black March, and even the Shoe Leather Express. Most of those that survived just called it “The March”. My dad, George Edwin Farrar, usually called it the “Forced March” when he told me stories of sleeping in the hay and stealing a chicken for food. Many books have been written about the 86-day 500-mile march of Stalag Luft IV prisoners. The best book on the subject is the original The Shoe Leather Express by Joseph P. O’Donnell. Joe was Stalag Luft IV POW 1414 and experienced the prison camp and the march firsthand. Joe wrote a series of six books on the subject of POWs, with the first book of the Shoe Leather Express series subtitled The Evacuation of Kriegsgefangenen Lager Stalag Luft IV Deutschland Germany. The harsh conditions of the march from Stalag Luft IV and treatment of the POWs is not well known. The march itself is rarely a topic of discussion in the subject of WWII history. But that needs to change. February 6, 2020 will mark the 75th Anniversary of the start of the Black March, and this event from history should be recognized and remembered. The 50th Anniversary of the Forced March was commemorated in the Congressional Record. On May 8, 1995, in the First Session of the 104th Congress, John William Warner entered the commemoration into the 141st Congressional Record (S6237). It may be read here in one of my past posts. As for Joseph O’Donnell’s Shoe Leather Express books, they are out of print and hard to find through used book sources, but the preface and first two chapters of the original Book I may be read online courtesy of Joseph O’Donnell and Gregory Hatton here. Candy Kyler Brown, daughter of Stalag Luft IV POW John R. Kyler kindly provided me with the titles of all the books in Joseph O’Donnell’s The Shoe Leather Express series. Candy began researching her father’s WWII and POW experiences long before I began researching mine and has produced both a website and book with must-read information for anyone interested in learning more about the WWII POW experience. Candy’s book, What I Never Told You: A Daughter Traces The Wartime Imprisonment Of Her Father, is available on Amazon. Candy’s website, Remember History, offers a wealth of information about her father and about her friend, Joseph O’Donnell, and his POW experiences. As Candy and I and other sons and daughters of Stalag Luft IV POWs have learned, it all starts with an inquisitive mind and a desire to know the truth about our fathers’ captivity during WWII. Don’t let this important part of our country’s history and your family’s history be lost to the past. Learn everything you can by reading published books and personal accounts published online. Search for your own family WWII-era letters and photos long packed away. If you’re lucky enough to have a living father, grandfather, or uncle in his mid-90’s, ask him if he served in WWII. Ask about his war service and learn everything you can from him. If he is a former prisoner of war, find out everything you can about his POW experience. Record it. Share it with the world or just share it with future generations of your family. We must not forget their service and we must not forget their sacrifice. Remember and make these men proud. In August, I wrote about an aspect of the WWII Black March of prisoners of war of Stalag Luft IV, the Combine. My father, George Edwin Farrar, who was a waist gunner in the 384th Bomb Group based in Grafton Underwood, England, was one of the prisoners on the March. Dad’s B-17 went down on September 28, 1944 and after a lengthy hospital stay, he was placed in Stalag Luft IV around Thanksgiving. 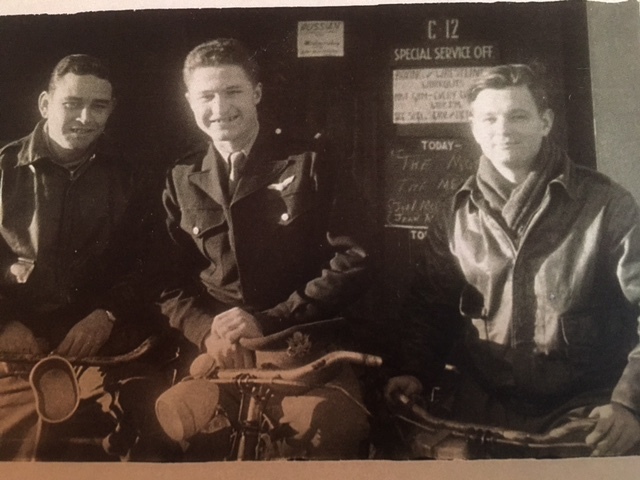 I have found that when the prisoners of Stalag Luft IV were marched out of the prison camp on February 6, 1945, Dad, RAF airman Laurie Newbold, and 351st Bomb Group waist gunner Cecil McWhorter likely made up a three-man combine. I learned of these men through a letter Laurie Newbold sent Dad on July 15, 1946. My search for Laurie Newbold began with his letter. 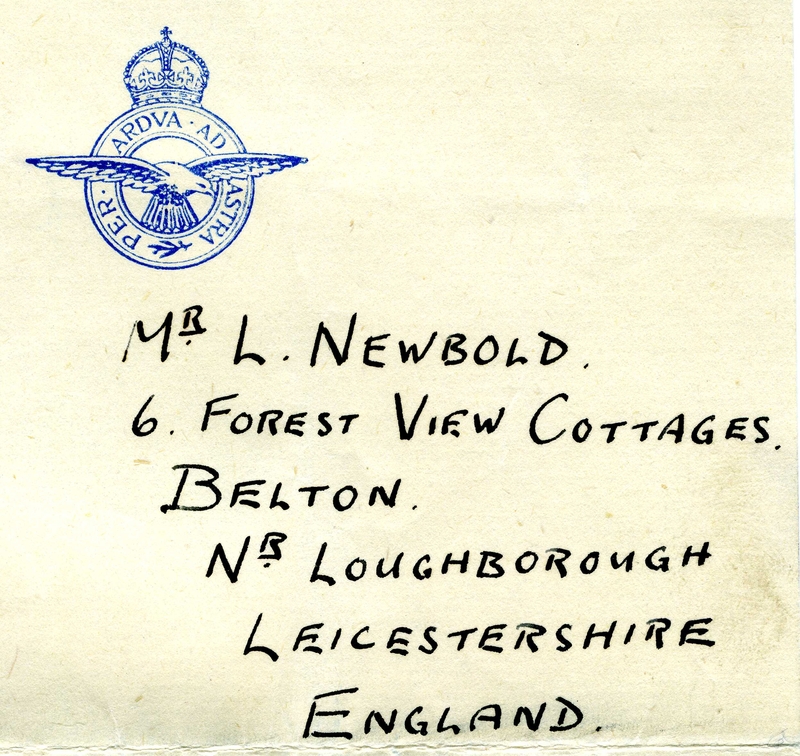 I had his address, 6 Forest View Cottages, Belton, NR Loughborough, Leicestershire, England. Belton is a parish, or small village, in the district of North West Leicestershire in England. A Google Maps search today does not find “6 Forest View Cottages” in Belton. I learned a few other things from the letter. Laurie was married and his wife’s father ran the local pub. Laurie had one son before his war service. And after he returned home from the war, he had a second son. The Queen’s Head Pub in Belton, Leicestershire has been a village pub for over 200 years. The building is a historic coaching inn which was built in the 1700’s. It has been a pub since 1800. Now it is a restaurant with a bar and accommodations. The Queen’s Head is situated in the center of the village facing the square. 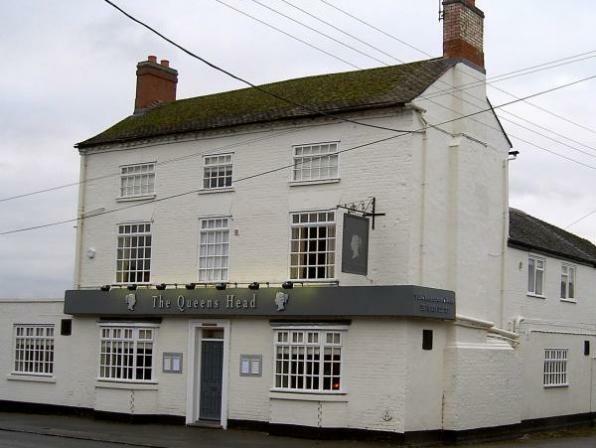 The pub is located at 2 Long Street, Belton, Loughborough, LE12 9TP. I e-mailed the pub and quickly received a response from Jo Newby, General Manager of the Queen’s Head. Jo did some checking and discovered that I had the correct Belton, England (there are two), but possibly not the right pub. Jo said that there were once two pubs in Belton. The other, the George Hotel, is no longer there, but she thinks it was the George which Laurie Newbold’s father-in-law ran. Jo found a few folks who remember Lawrence (Laurie) Newbold. A couple of Jo Newby’s regulars at the Queen’s Head, Barry and Mary-Jean, know a lot about Laurie. He was Mary-Jean’s uncle and they lived next door to him. Laurie Newbold had three children, Michael, Stephen, and Janice. Laurie has passed away and so have Michael and Janice. But Stephen is still alive and lives in the adjacent village of Long Whatton. Jo found an interesting photo hanging on a wall of the Queen’s Head Pub. 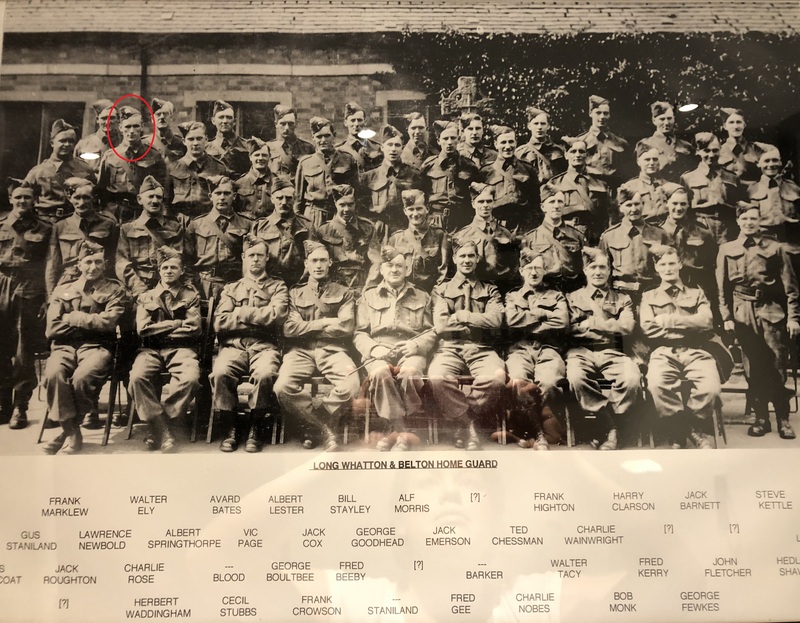 It is a picture of Laurie Newbold and the Long Whatton and Belton Home Guard. In the photo, Laurie Newbold is standing second from left in the second from top row. I have circled him in the photo. More internet searches revealed that L.E. (Laurie) Newbold was a Sergeant in the RAF, in the No. 50 Squadron of Bomber Command. He became a POW on March 18, 1944 when his Avro Lancaster #ED-308 went down on a mission to Frankfurt. The No. 50 Squadron flew out of RAF Skellingthorpe in Lincoln, England, from November 26,1941 to June 20, 1942 and October 17, 1942 to June 15, 1945. Skellingthorpe was about seventy miles north of Grafton Underwood (where my dad was stationed) and Polebrook (where Cecil McWhorter was stationed). On Saturday, 18 March 1944, (a part of) the aircraft of the 50 squadron (RAF), took off for a mission to Frankfurt in Germany from a station (airfield) in or near Skellingthorpe. One of the crew members was Flight Sergeant H J Rouse. He departed for his mission at 19:15. He flew with a Avro Lancaster (type I, with serial ED308 and code VN-J). His mission and of the other crew members was planned for Sunday, 19 March 1944. I found a list of the crew aboard ED-308 on March 18, 1944 on the UK’s National Archives website. Once the page opens, scroll down and click Preview an image of this record. Select Image 12 and then go to full screen. About halfway down the page, you will see 18/19 March 1944 in the left column. Zooming in helps immensely. You can view the crew listing and comments even though viewing is obstructed by a water mark. The pilot’s last name is Miller, and fourth line down on Miller’s crew is Sgt. L.E. Newbold. The Sortie notes state: Bombing Attack on Frankfurt. Aircraft Missing – no signal received. I’m happy to have learned more about Laurie Newbold and have a photo of him thanks to Jo Newby. Perhaps someday Stephen Newbold and I will be able to meet face to face. I think that if I can look directly into his eyes, I will be able to see the ghost of his father and he will be able to see the ghost of mine, how they appeared seventy-four years ago when they helped each other survive what was probably the most fearful time in their lives, and watched each other waste away from lack of food, illness, and other hardships of marching across Germany, not knowing if they would live to ever see their families again. Stephen Newbold, this is our shared history. The history of our fathers, two survivors of WWII. On his final mission, Cecil McWhorter was left waist gunner on the Charles E. Cregar, Jr. crew of the 511th Bomb Squadron of the 351st Bomb Group on the October 3, 1944 Mission #213 to the Nuremburg Railroad Marshaling Yards. They were aboard B-17G 43-38518, which was a new ship assigned to the 511st Bomb Squad/351st Bomb Group less than two weeks before on September 21 according to Dave Osborne’s B-17 Fortress Master Log. Cecil was on his twelfth mission with the 351st. All on board were taken prisoner of war with the exception of bombardier John F. Dwyer, who lost his life on that mission. The details of MIssing Air Crew Report 9358 (MACR9358) explain what happened on October 3, 1944 to the Cregar crew. According to witnesses from other aircraft in the formation, the Cregar crew’s 43-38518 left the formation at 1150 hours under control for causes unknown. Pilot Donald Hadley noticed that Lt. Cregar’s plane failed to turn with the formation coming off the target. Hadley reported no visible signs of damage and all four engines turning. There were no fighters in the area, but there was moderate flak. Cregar never caught up with the formation and descended under control out of sight. Hadley saw no parachutes and heard no radio call from 43-38518. Another witness, tail gunner Jack Tucker, reported much the same as Donald Hadley, adding that as the plane left the formation, it began to lose altitude and traveled in an easterly direction. He saw nothing to indicate that Cregar’s plane was damaged and the last he saw of them, they were flying at about 8500 feet (descending from their flying altitude of 25,500 feet). Either Hadley or Tucker later added that thirty minutes after the aircraft left the formation, the pilot was heard to call for fighter support over VHF. The first shell burst about ten feet in front of the nose slightly to the right. A small fragment entered his head thru his steel helmet, earphone, and skull and started profuse bleeding. I administered firstaid to no avail and in a few minutes he was dead. His body was left with the plane, which did not burn, when last seen. The pilot left formation in an attempt to fly the badly damaged ship to Switzerland. The radio operator, Elwood Zigenfus, and tail gunner, Thomas Richardson, both reported that the pilot and co-pilot remained at the controls while the rest of the crew, with the exception of bombardier John Dwyer who was dead in the nose of the ship, assumed ditching positions in the radio room. Bombardier John F. Dwyer (born September 10, 1918) was found dead in the aircraft after the emergency landing. His date and place of death were listed as October 3, 1944 in Stillnau at Leipheim/Donau. His initial date and place of interment were October 7, 1944 at Leipheim/Donau town cemetery. One of the crew said that the German guards reported that Dwyer was given a military funeral near where the ship went down, a small town named Dillingen. According to Findagrave.com, Dwyer was later re-interred at Lorraine American Cemetery and Memorial at Saint-Avold, Department de la Moselle, Lorraine, France. All members of crew remained in the plane until we crash landed. One member was killed by the flak burst which knocked out our four engines. All other members uninjured then or in the crash landing that followed. Dad would never discuss the war, Mom said it brought up terrible memories. He regretted the death of his one crew member, and never discussed POW with anyone…Dad had fun, enjoyed friends including Ernie Kovacs (TV comedian), who was a childhood friend and Ziggy (from the flight crew). Never would eat potato soup or cabbage, apparently a POW thing. Killed in Action (KIA) Crashed near Stellnau in B-17 4338518. Lt. Dwyer was a member of the International Guards before Pearl Harbor and first served with the Infantry, then being transferred to the air corps. He received his training at Santa Anna, Cal., Las Vegas, Nev., Carlsbad, NM, and Avon Park, Fla. He was overseas from July 1944, and had completed twelve missions. Lt. Dwyer received the Presidential Group Citation and a posthumous Purple Heart. Pages for the remainder of the crew, including Cecil McWhorter, do not include any additional information or photos. Thank you to 384th Bomb Group researcher Keith Ellefson for getting me a copy of Missing Air Crew Report 9358. If you are a relative of 351st Bomb Group waist gunner Cecil C. McWhorter, or others on the Charles Cregar crew, or RAF airman Laurie Newbold, please Contact Me. A few weeks ago, I wrote about an aspect of the WWII Black March of prisoners of war of Stalag Luft IV, the Combine. My father, George Edwin Farrar, who was a waist gunner in the 384th Bomb Group based in Grafton Underwood, England, was one of the prisoners on the March. Dad’s B-17 went down on September 28, 1944 and after a lengthy hospital stay, he was placed in Stalag Luft IV around Thanksgiving. I have found that when the prisoners of Stalag Luft IV were marched out of the prison camp on February 6, 1945, Dad, RAF airman Laurie Newbold, and 351st Bomb Group waist gunner Cecil McWhorter likely made up a three-man combine. This is not information that my dad shared with me. He never mentioned these men when he told me stories of the POW camp and March. These things I had to find on my own, but as a place to start, he left a clue, a letter he had saved since 1946. Most of the letters in the bundle my dad saved since the war were written by the families of my dad’s crew between the time the crew went missing and the end of the war. But this one was dated July 15, 1946 and it came from England. It was from Laurie Newbold, an airman with England’s RAF and it was clear that he had been close to my father when they were prisoners of war. In his letter, Laurie mentioned another airman, this one American. 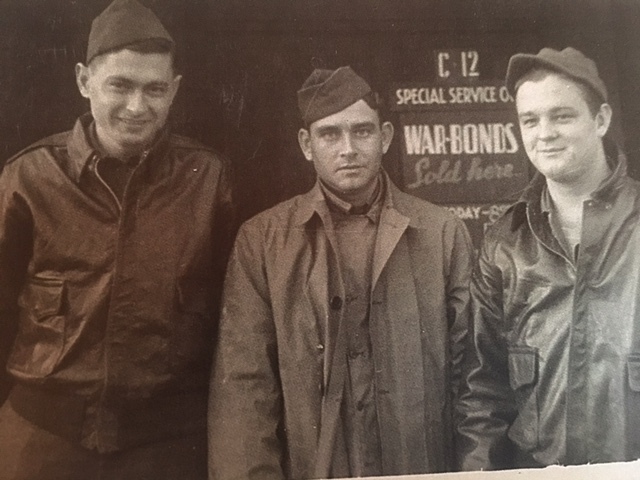 My dad, Laurie Newbold, and a man Laurie called “Old Mac Whorter” roomed together at Stalag Luft IV and likely marched together in the Black March. Laurie also noted that this man lived in East Bernstadt, Kentucky. Dad, Laurie, and “Old Mac Whorter” were assigned to Room 12, hut number unknown, compound unknown. Gregory Hatton runs a memorial website on Stalag Luft IV. Among the interesting information Greg presents is a document that contains a “Report of the International Committee of the Red Cross Visit of Oct. 5 & 6, 1944 by Mr. Biner, Stalag Luft IV.” In a section describing the accommodations at the camp, the report notes that there are four camps or compounds within Luft IV: A, B, C, and D.
A, B, and C contained Americans only. Camp D contained American and British. I must assume that my father and “Old Mac Whorter” were in Camp D as they were housed with British RAF POW Laurie Newbold. 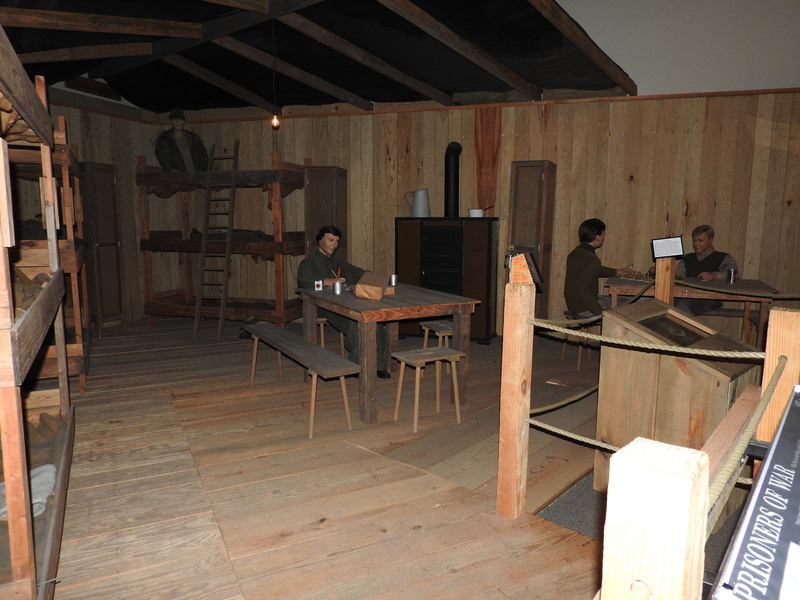 I don’t know how many barracks or huts were built in Camp D and haven’t yet found a way to determine which one they were in, but apparently they were in Room 12 of their hut. I wanted to know more about the two men my dad spent his darkest days with in the prison camp and on the March. Since “Old Mac Whorter” was an American, I thought I would research him first since I am more familiar with the American WWII airman websites and genealogical sites. To discover the real name of “Old Mac Whorter,” I had to make a few guesses. First, the man’s last name was probably MacWhorter or McWhorter. Searching the National Archives database of WWII prisoners of war in Stalag Luft IV, I found him. Not easily, but I found him. For some reason, the database listed his last name as Mc Whorter, with a space after the “Mc.” But here was a good candidate, Cecil C. McWhorter, and his home was in Kentucky. Cecil C. McWhorter’s Army Air Forces serial number was 6285927. He was a staff sergeant in the Air Corps, had become a POW on October 3, 1944, and served with the 351st Bomb Group. The 351st was a B-17 group based in Polebrook, England, not very far from my dad’s group, the 384th in Grafton Underwood, less than fifteen miles away. Cecil’s plane went down just five days after my dad’s. Continuing my National Archives search, I found Cecil’s enlistment record. It revealed he was born in 1918 and he resided in Laurel County, Kentucky. The city Laurie Newbold mentioned in his letter, East Bernstadt, is a city in Laurel County. Cecil enlisted in the Air Corps on December 19, 1941. I realized Cecil must have also served in another capacity or he would have finished his tour and returned home long before he became a POW in 1944. I did not discover how or where else he served at this point in my research. When I followed a link to the page for the aircraft (unnamed 43-38518), I learned even more details: where the ship crashed, the names of the crew, and the Missing Air Crew Report number, 9358. Now that I knew which bomb group of the 8th Air Force Cecil served in, I searched for more information for his group, the 351st. I found they have both a website and a Facebook group page. The 351st Bomb Group’s website contains detailed information about Cecil’s last mission, the crew he flew with, their target for October 3, 1944, the B-17 they were aboard, and the number for the missing air crew report, MACR9358. The March 2017 issue of the 8th AF News contains a wonderful story, “Band of Daughters.” The story is about two women, Ellen Hartman and Laura Edge, and their adventure together to visit the WWII prison camp, Stalag Luft IV, where their fathers and my father, were held as prisoners of war. You can read the story here. Laura holds a Masters of Social Studies Education degree and wrote the book “On the Wings of Dawn: American Airmen as Germany’s Prisoners – Their Story of Courage, Sacrifice, and Survival.” Ellen owns her own public relations agency in Atlanta and is just beginning to research her father’s service in WWII. You can read the post I wrote about Ellen’s father, Joe Weaver, here. I contacted both Ellen and Laura and learned that they had big plans for this year’s Fourth of July weekend in Savannah. They would be visiting the National Museum of the Mighty Eighth Air Force. 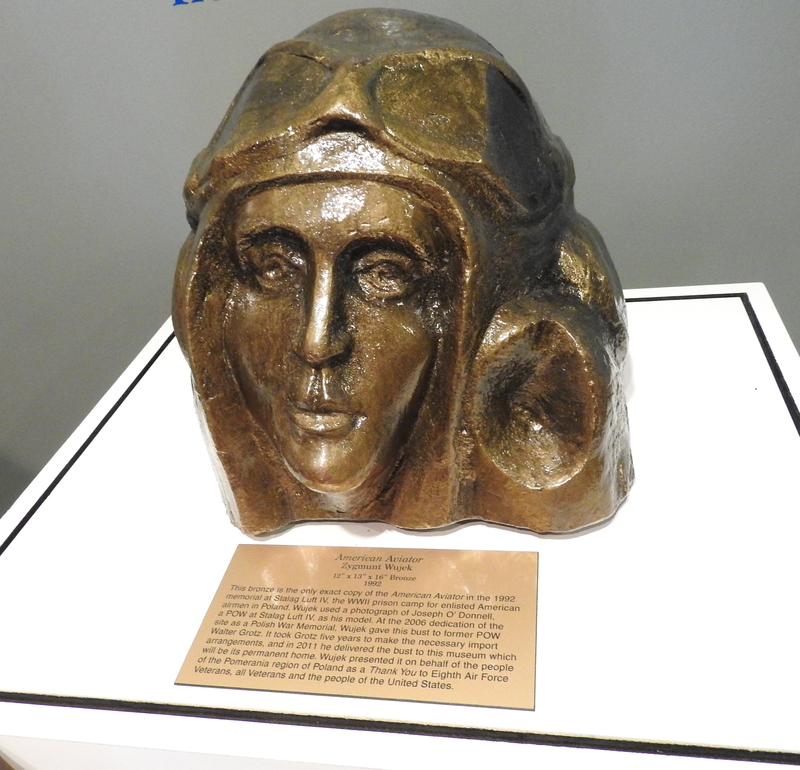 Joining them would be Zygmunt Wujek, a Polish sculptor, and Jupi Podlaszewski, head of the English School of Koszalin. Zygmunt created the memorial sculpture at the site of Stalag Luft IV. A WWII veteran of the 8th Air Force, Walter Grotz, was to join the group. 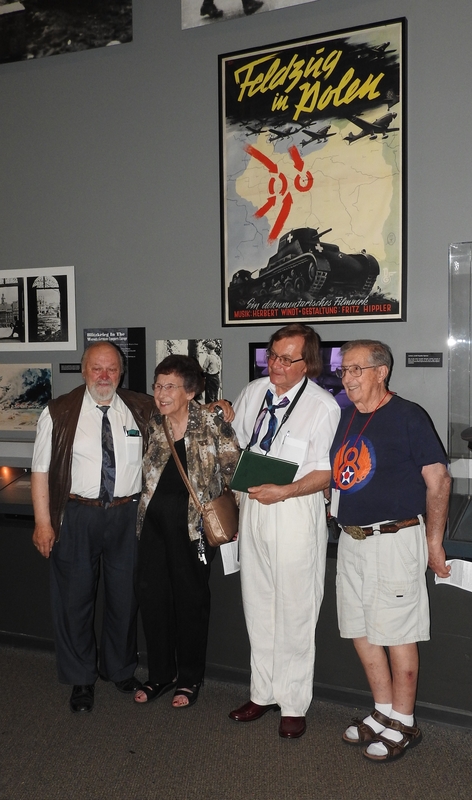 Walter, of the 445th Bomb Group and his wife, Mary, sponsored the Polish dignitaries’ journey to the US. 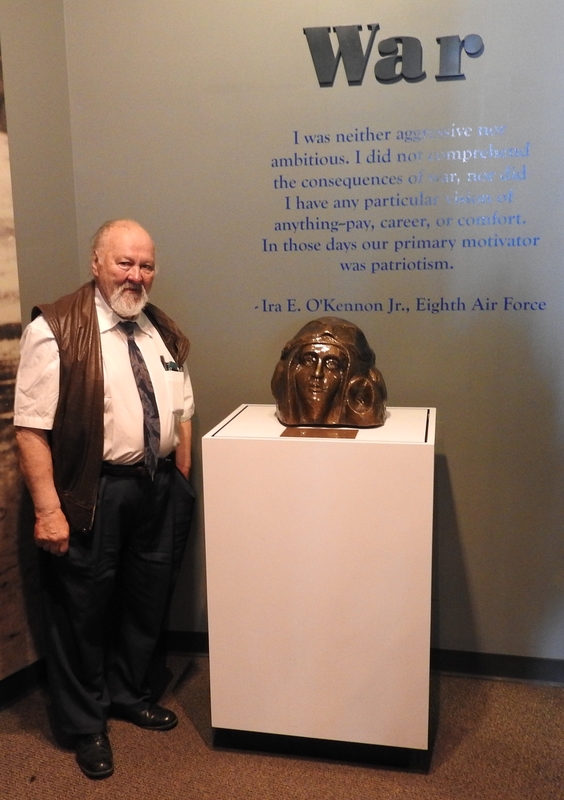 Walter and Mary had a B-24 propeller blade to donate to the museum and wanted Zygmunt to see his American Airman’s home in the museum. Walter became a prisoner at Stalag Luft IV when he had to bail out of his B-24 on the November 26, 1944 mission to an oil refinery at Hannover, Germany. Sadly, Walter Grotz died in May, but his wife, Mary, carried on Walter’s wishes and joined the group in Savannah. is the only exact copy of the “American Aviator” in the 1992 memorial at Stalag Luft IV, the WWII prison camp for enlisted American airmen in Poland. Wujek used a photograph of Joseph O’Donnell, a POW at Stalag Luft IV, as his model. At the 2006 dedication of the site as a Polish War Memorial, Wujek gave this bust to former POW Walter Grotz. It took Grotz five years to make the necessary import arrangements, and in 2011 he delivered the bust to this museum which will be its permanent home. Wujek presented it on behalf of the people of the Pomerania region of Poland as a Thank You to Eighth Air Force Veterans, all Veterans and the people of the United States. Zygmunt Wujek and Mary Grotz admire Zygmunt’s work. The organizer of the Savannah group, Ellen Hartman, was kind enough to invite me at join them as the fourth Stalag Luft IV daughter. 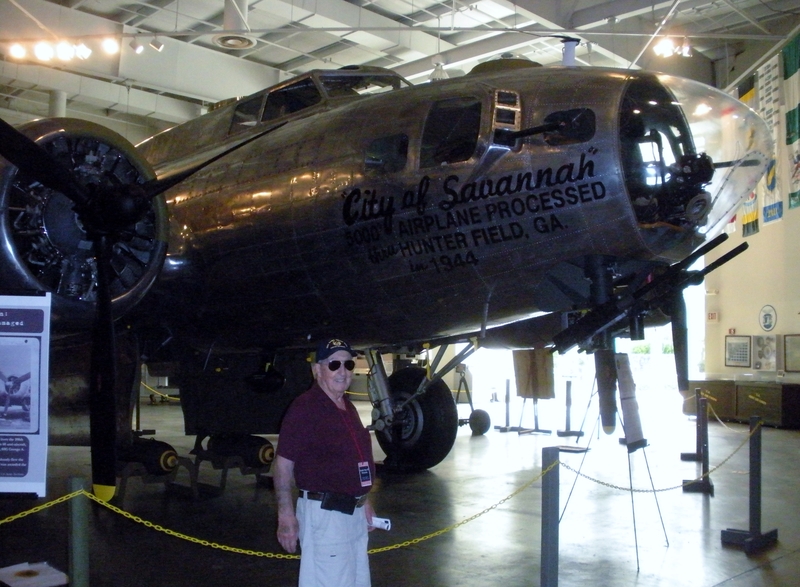 And I, knowing that a WWII veteran living near me, John DeFrancesco, had a great desire to see the Museum of the Mighty Eighth Air Force, invited him to go to Savannah with me. John had been a POW in WWII, but not in Stalag Luft IV. John was a pilot with the 384th Bomb Group, 544th Bomb Squadron, the same group and squadron in which my dad served. John was on his thirty-fifth mission on January 8, 1945 to a railroad line in Kyllburg, Germany when two of his engines exploded and his B-17 caught fire. After bailing out of the crippled aircraft, John was a POW at Stalag 13D Nuremburg (Oflag 73) Bavaria, an officers’ camp, and later after a forced march, was held at Stalag 7A (Moosburg). Our experience at the Museum of the Mighty Eighth Air Force was extraordinary. 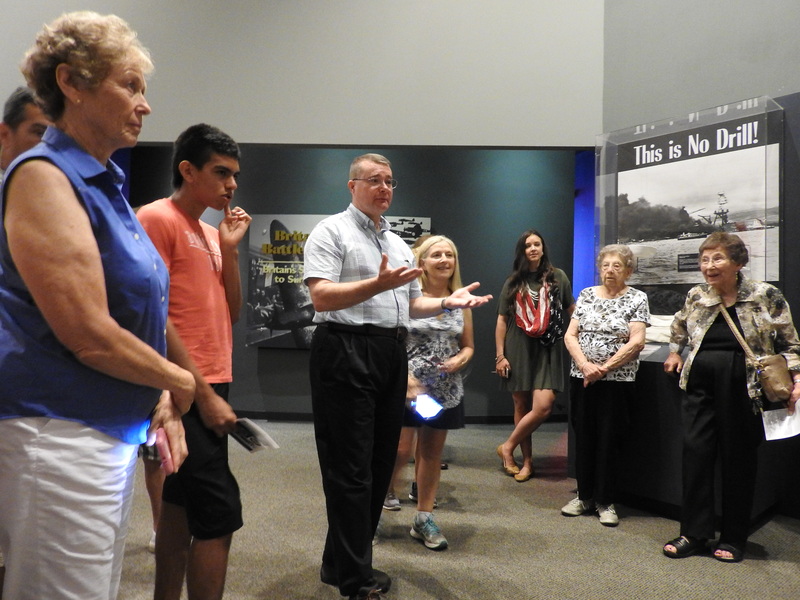 In addition to touring the museum on our own (we took advantage of every free moment in our schedule to see as much as we could), we had two excellent guided tours. 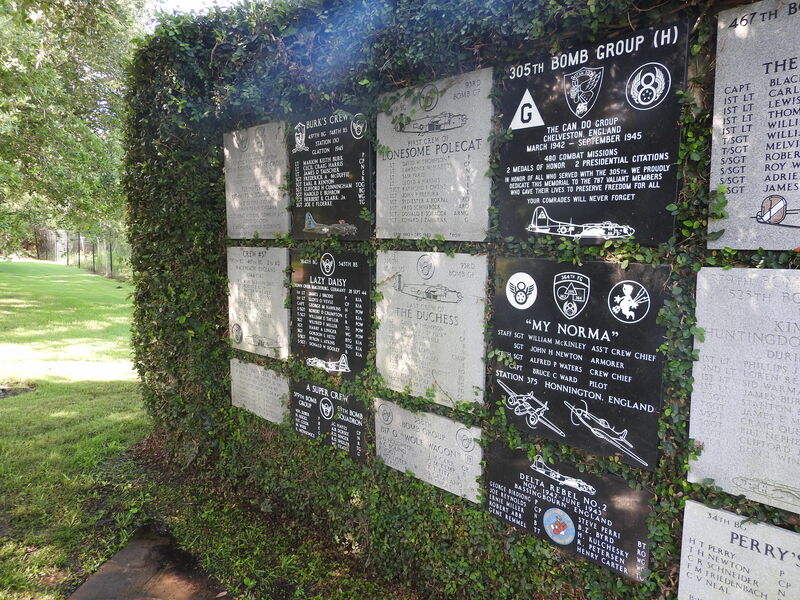 Our first tour was led by 384th Bomb Group, Inc. Historian and NexGen Research Director John Edwards. John was one of the original nine who started the Museum of the Mighty Eighth. Between John’s history with the museum and his interest in aviation research, John’s tour offered our group a unique insight to the museum and the WWII history of the 8th Air Force. Our second tour was led by Al Pela, museum docent and son of Stalag Luft IV POW Albert Pela who was a flexible gunner with the 100th Bomb Group, also known as “The Bloody Hundreth.” Albert’s B-17 crashed at Gottesgab (now Bozi Dar, Czech Republic) on September 11, 1944. 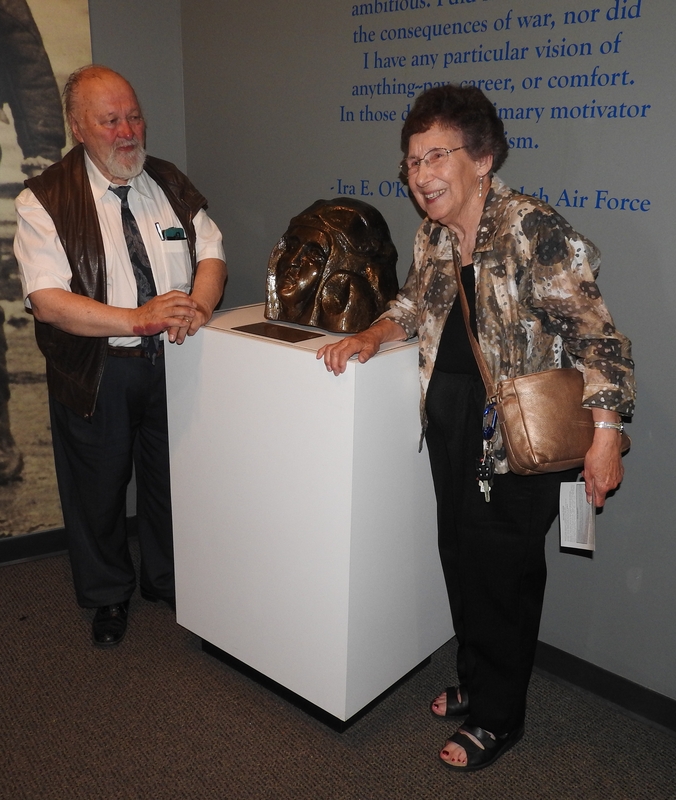 Al’s stories of his father’s experiences at Stalag Luft IV added another perspective to our museum experience. 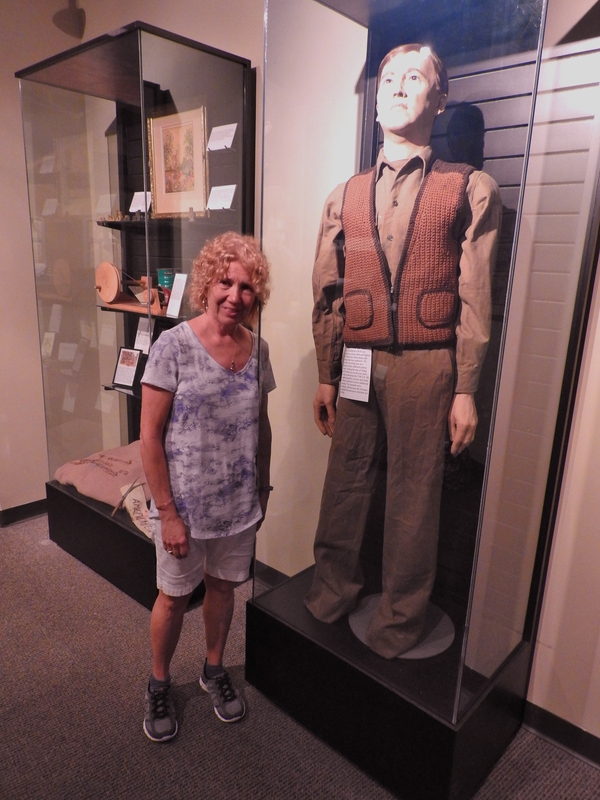 Just past the POW exhibit in the museum is a display case in which the vest that Candy Kyler Brown’s father, John Roland Kyler, made while he was a prisoner of war in Stalag Luft IV. Candy proudly shows her father’s work to the group. Kyler knitted the vest from a Red Cross-provided kit and he was able to bring it home on his trek across Germany in the Black March. The museum is full of wonderful displays. 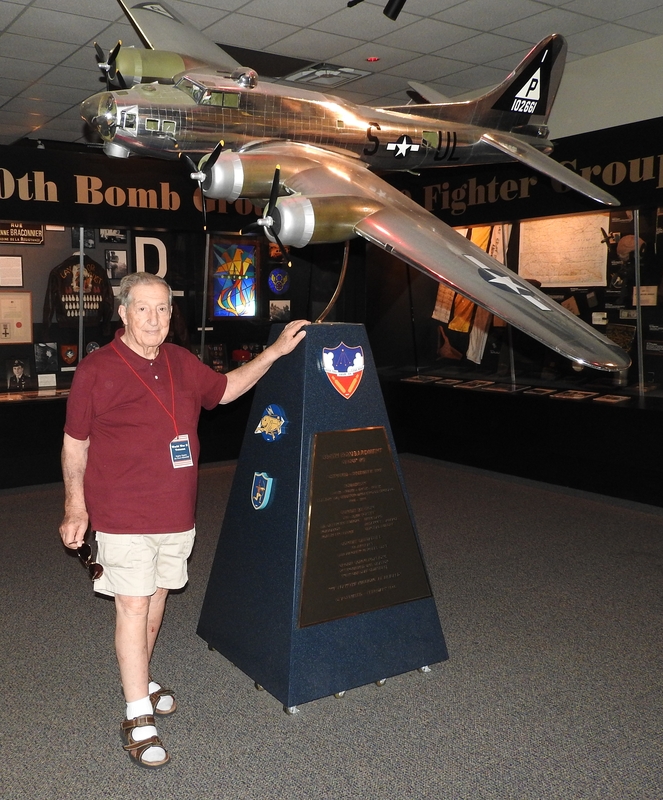 John DeFrancesco stands in front of a memorial to the 384th Bomb Group complete with a model of a B-17. Past a set of glass doors at the back of the large space housing the B-17 and other aircraft is the museum’s memorial garden. 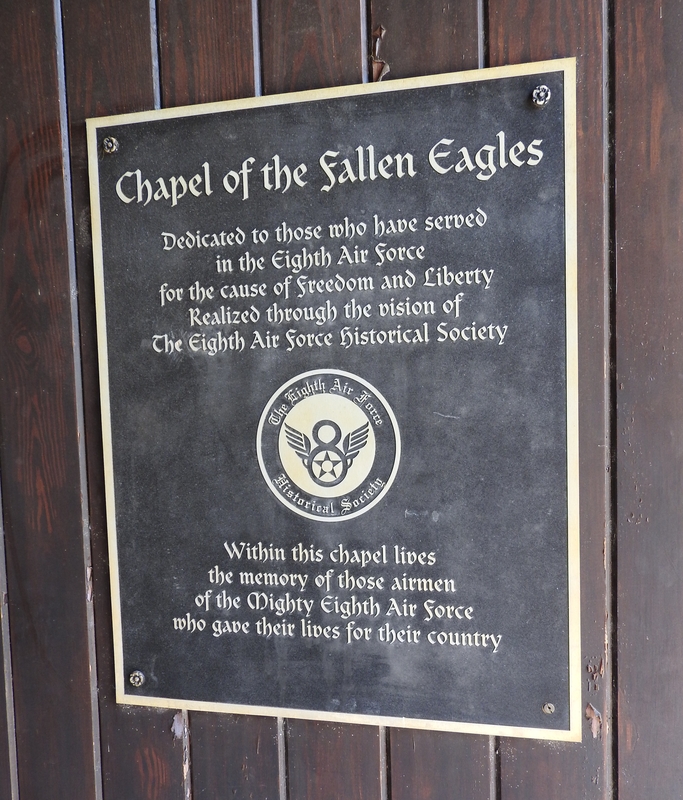 The garden is a beautiful, peaceful place full of memorials to groups and members of the 8th Air Force and the Chapel of the Fallen Eagles. 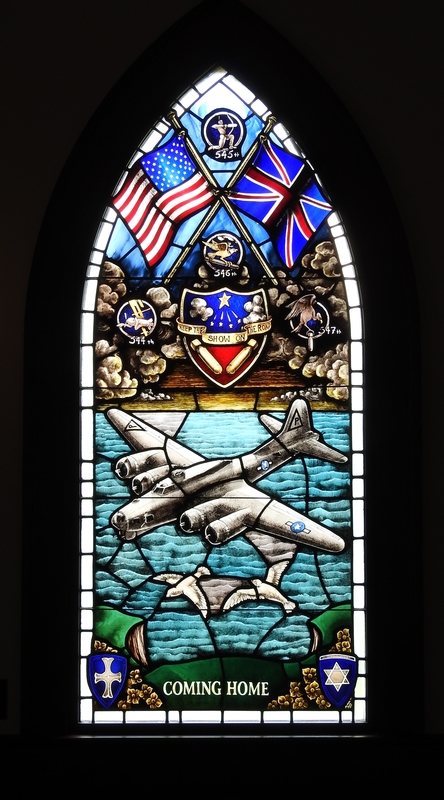 … including a replica of the one honoring the 384th Bomb Group in the Church of St James the Apostle in Grafton Underwood, England. 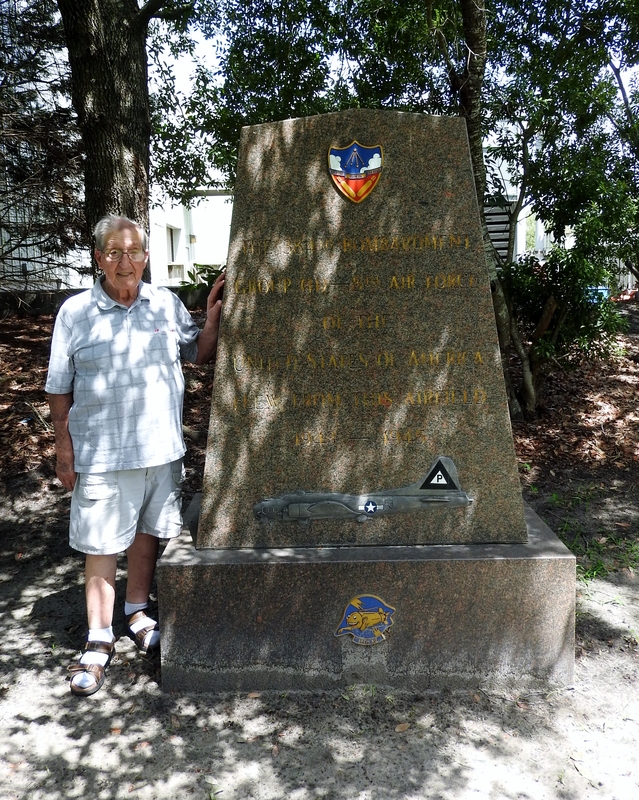 John DeFrancesco stands in front of a replica of the 384th Bomb Group Memorial in Grafton Underwood, England, where the group was stationed during WWII. 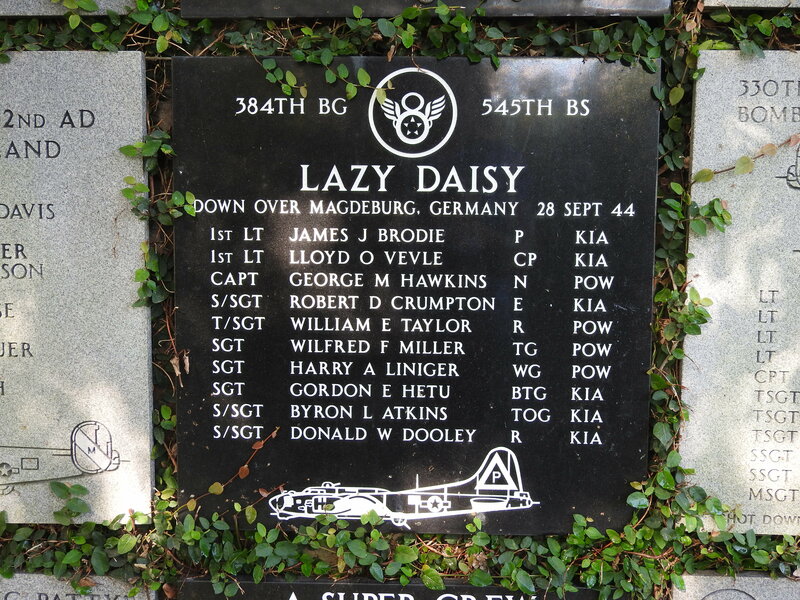 After some help from Al Pela, I was able to find the memorial to the Brodie crew of the B-17 Lazy Daisy which collided with the B-17 Lead Banana on which my dad was the waist gunner on September 28, 1944. 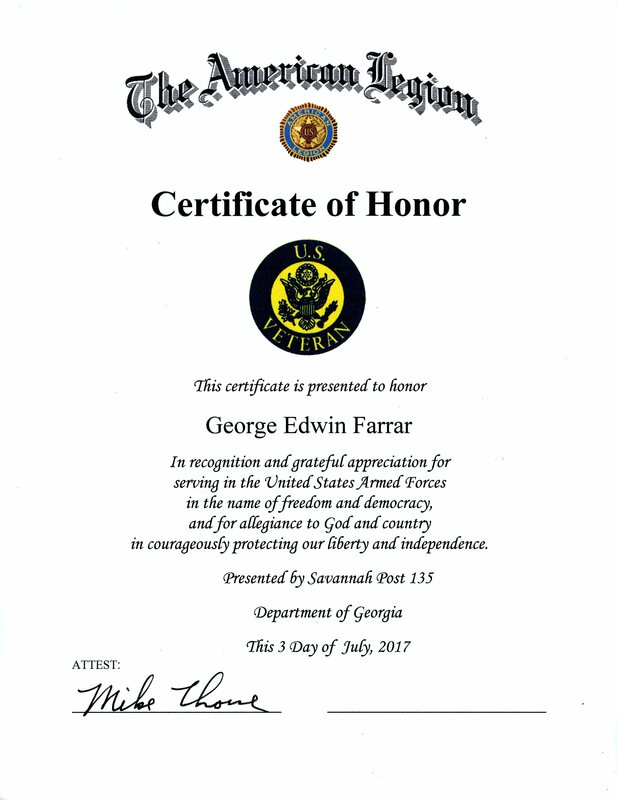 To end this wonderful weekend, our group was honored at the American Legion Post 135 which is housed at 1108 Bull Street in Savannah, where on January 28, 1942, the Eighth Air Force was activated. 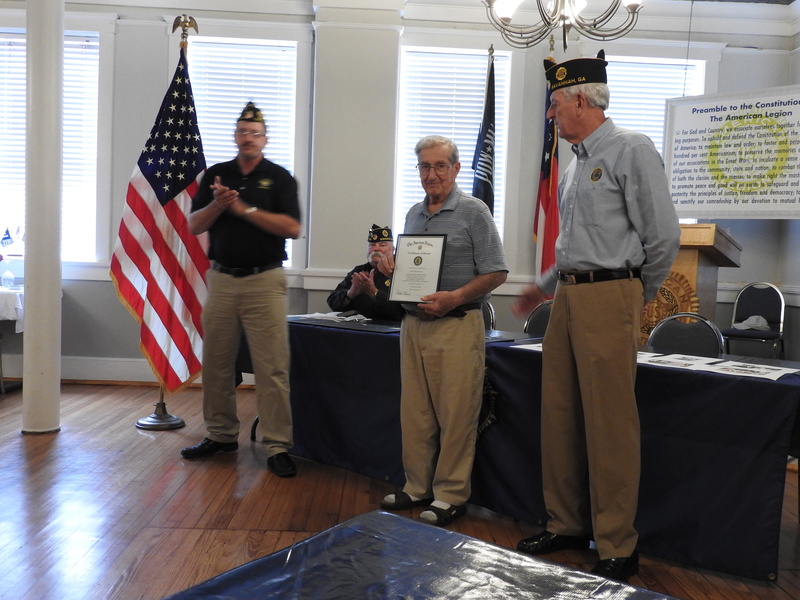 In addition to honoring the WWII veteran of our group, John DeFrancesco, the American Legion also honored Zygmunt Wujek, Walter Grotz, and each of the Stalag Luft IV daughters’ fathers. Following the ceremony at the American Legion, our group enjoyed a spectacular dinner right next door at the restaurant Local11ten. It was the perfect ending to the perfect adventure for this group which was brought together because of a shared history in WWII. That adventure ended, but I suspect a new journey is just beginning. 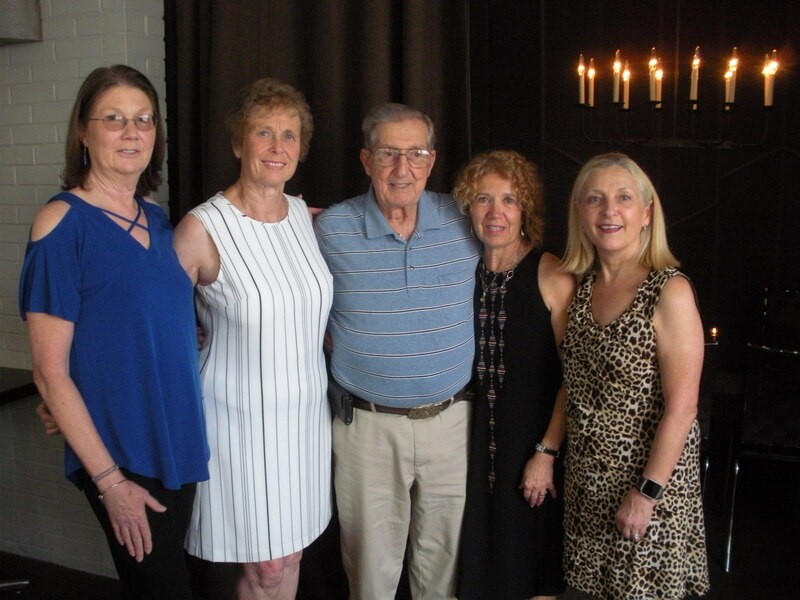 Four daughters of Stalag Luft IV with WWII veteran John DeFrancesco. I don’t know how many of you are members of the Eighth Air Force Historical Society, but I am a member and receive their 8th AF News magazine. I was intrigued by the cover of the March 2017 issue I received in the mail. The cover photo was a woman named Ellen Weaver Hartman holding dog tags and surrounded by photos and other items. The item that caught my eye was a small piece of wood inscribed with “Stalag Luft IV 1944.” Stalag Luft IV was the prison camp in which my dad was held POW in 1944 and 1945. I quickly turned to the article, “Band of Daughters.” It was a reprint of an article by Josh Green for the Atlanta Journal Constitution newspaper. You can read the entire article here. I went on to read the story of Ellen Weaver Hartman and Laura Witt Edge. Ellen’s dad was Joseph (Joe) Donald Weaver, who was a Radio Operator/Mechanic Gunner with the 9th Air Force, 386th Bomb Group, 554th Bomb Squad. According to the American Air Museum in Britain, the 386th Bomb Group flew B-26 Marauders for the Eighth and Ninth Air Forces. While assigned to the Eighth Air Force, the 386th developed the formation release procedure for the B-26, a medium bomber, on missions from Great Dunmow, England in the winter of 1943 – 1944 to aerodromes, marshalling yards and V-weapon sites along the coast of France. In October 1944, the 386th moved to Beaumont-sur-Oise, north of Paris, and on to St. Trond, Belgium in support of the push eastward by ground forces. Laura’s dad was Lawrence (Larry) Lee Witt, who was an Engineer/Waist Gunner with the 8th Air Force, 96th Bomb Group, 338th Bomb Squad. According the the American Air Museum in Britain, the 96th Bomb Group flew B-17 Flying Fortresses to targets across occupied Europe from May 1943 to April 1945. They were awarded two Distinguished Unit Citations, the first for bombing an aircraft factory at Regensburg on August 17, 1943 under intense pressure from enemy fighters. The second was for leading the 45th Bomb Wing through difficult weather conditions and anti-aircraft fire on a mission to an aircraft components factories at Poznan on April 9, 1944. Laura Edge knows a great deal about her father’s service in WWII. When her father was in his eighties, Laura sat down with him and one of his old crewmates and they told her their stories of WWII, Stalag Luft IV, and the Black March they endured while prisoners of war. Laura wrote a book, On the Wings of Dawn, a well-written and excellent record of the experiences of the American airmen who shared those experiences. I consider it a must-read for anyone whose father was confined in Stalag Luft IV during WWII and I will write more about it in a future post. 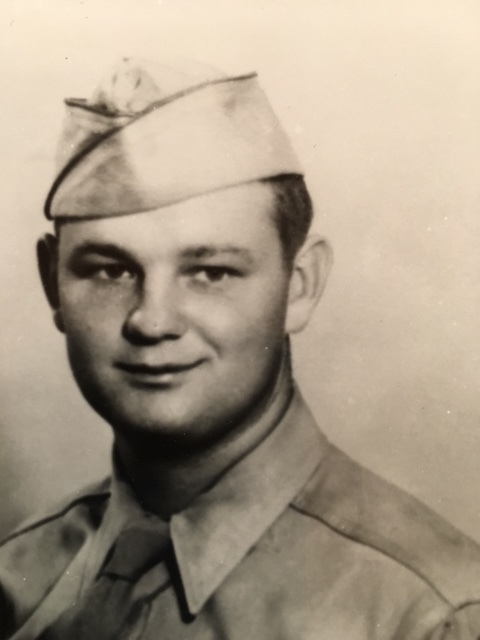 While Laura Edge knows a great deal about her father’s service in WWII, Ellen Weaver Hartman does not have as much information about her father’s service, but she would like to learn more. Who were the members of Joe Weaver’s originally assigned crew? How can she find a photo of that crew? If you have found your way to this article through an internet search on one of the names I’ve mentioned here, or if you recognize any of the faces in the included photos, and you have any information to share, I urge you to comment on this post or e-mail Ellen directly. Joseph (Joe) Donald Weaver was born on August 28, 1923 in Ackerman, Mississippi. On October 8, 1942, he enlisted in the Army Air Corps at Camp Shelby, Mississippi. 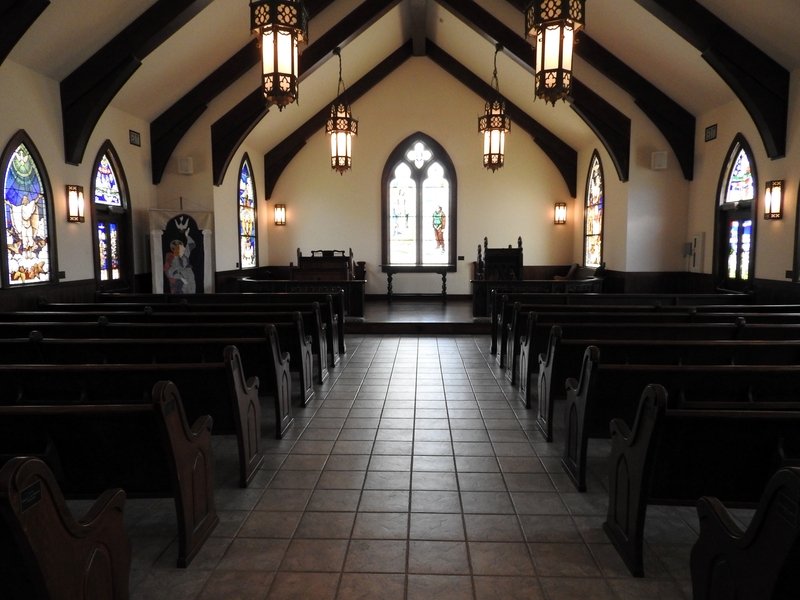 At the time, he was living in Choctaw County. He was assigned service number 14150971. Joe served in the 8th AF, 386th Bomb Group, 554th Bomb Squad as a radio operator/gunner on a B-26 Maurader. The 386th Bomb Group started out with the 8th AF, but transferred to the 9th AF in 1944. Early in his overseas service, Joe was in a training accident in Ireland with pilot Robert G. Fry. The American Air Museum in Britain describes Fry as an Instructor (Pilot) with the 3rd Combat Crew Replacement Center. On December 27, 1943, B-26 #41-17961 was involved in a landing accident at Froome Airfield (Station 236) near Antrim, Northern Ireland after a local training flight. The aircraft landed in a small field. Joe Weaver and four others returned. John Latiloasis was from Louisiana and remained friends with Joe Weaver after the war. The American Air Museum in Britain web site notes that after flying fifty-one missions with the Lt. Fry crew, Joe Weaver was assigned to the 386th Bomb Group, 554th Bomb Squadron of the 9th Air Force. 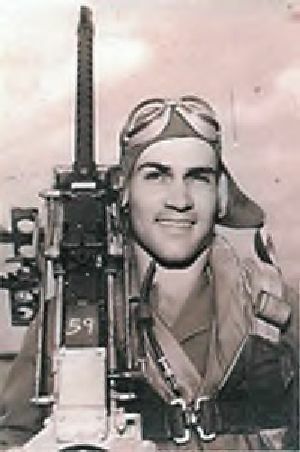 Joe was a Radio Operator/Mechanical Gunner. On the August 6, 1944 mission to bomb fuel dumps near the Forêt d’Andainnein, east of the Domfront region of Calvados, France, Joe was flying with pilot Walter Edward Payne in B-26 #42-96184. This was Joe’s fifty-second mission, but his and the other gunners’ first mission with Captain Payne. Joe replaced Payne’s regular radio operator who had just completed his tour. Hit by flak, the plane crashed in the English Channel, one mile off the coast at Trouville-sur-Mer. Joe Weaver was made prisoner (POW) and was interned at Stalag Luft IV in Gross Tychow/Tychowo, Poland. Four others, including Captain Payne, were also made prisoners of war. Gunner Franklin E. Swanson was killed. Payne, Altvater, and Roggenkamp were all on their 63rd mission. All three were made prisoner. Ap. 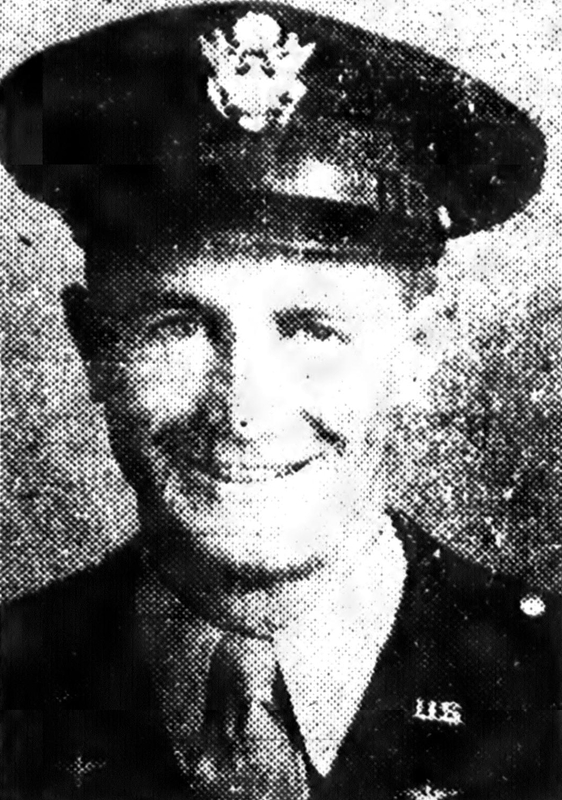 Armorer Gunner Sgt Franklin E. Swanson (KIA) (injured by flak and his chute failed to open – Killed In Action). The three enlisted men on board were all experienced gunners who had flown on earlier missions and were replacing the Payne crew’s regular gunners who had flown more than the sixty-five required missions (some with other crews) and had completed their tours. I was flying as tail gunner in lead aircraft of formation in which Captain Payne was flying deputy lead. Capt. Payne’s aircraft was hit by flak, causing fire in the right engine, which didn’t seem too large and was apparently unnoticed because ship was equipped with engine fire extinguishers. The flames subsided for a moment then flared up brightly and I saw three chutes from the tail end of the ship. The pilot held the ship in formation for a time but was losing altitude slowly and the engine was burning brightly. Two more chutes which evidently came from the front end of the ship, blossomed out as the ship began to lose altitude more rapidly. When about one mile off shore the right engine and wing came away from the ship and the ship itself spiraled into the channel. I did not see a sixth chute from this aircraft. My vision was blurred after the first few minutes by hydraulic fluid which was smearing my plexiglass windshield. 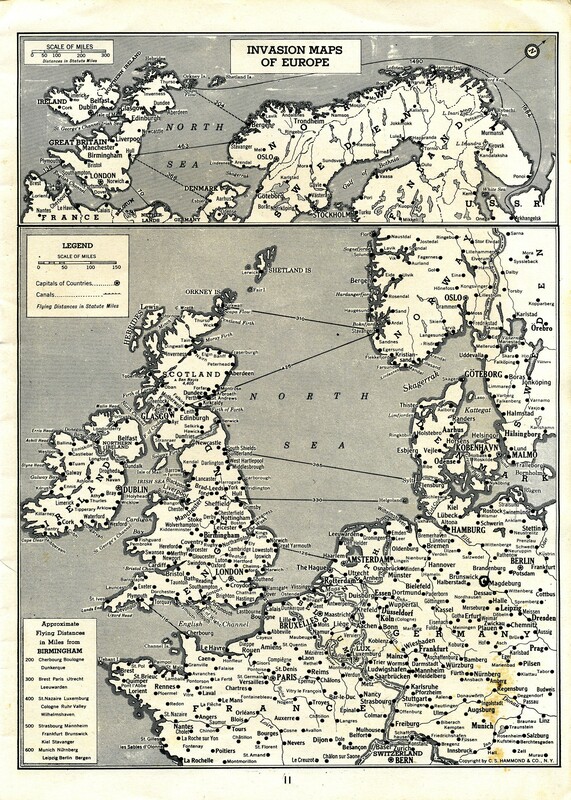 This map, included in the missing air crew report was likely drawn by S/Sgt. Zuckerman to indicate the path of the aircraft, flying through the flak area and over the English Channel until it crashed in the Channel. Zuckerman also includes lattitude and longitude markings on his drawing. Zuckerman has drawn an outline around the flak area. Note the zig-zagging pattern of the aircraft through the flak area, attempting to evade the flak guns. The crew bailed out somewhere along the line indicating the aircraft’s path and probably landed somewhere between the flak area and the coastline at Trouville-sur-Mer, except for the co-pilot who actually landed in the channel about fifty feet offshore on a sandbar. According to Lt. Altvater, bombardier/navigator Lt. Roggenkamp commented on the return trip from the target that they were getting too close to Le Havre, which was heavily defended by flak guns. He did not understand why the formation did not turn to avoid Le Havre, but they had no choice but to follow the lead aircraft. Lt. Altvater reported an ear-splitting explosion and realized that they had taken a direct hit from the 88mm flak guns in Le Havre. The windshield was hit and the pilot compartment was littered with dust, debris, Plexiglass splinters, and shell fragments. The fuel tanks in the right wing were punctured and spewing aviation fuel. Shortly after, they were on fire. About four minutes before the crew bailed out, Sgt. Swanson announced by interphone that he had been hit by flak, but that he would not leave his guns. They left formation approximately three minutes south of Trouville-sur-Mer. Lt. Roggenkamp, then Lt. Altvater bailed out of the aircraft through the bomb bay slightly west of Trouville, France. Cpl. Salyer, then Sgt. Weaver, then Sgt. Swanson left the aircraft through the waist window over Trouville. The last to bail out, Payne followed Altvater and Roggenkamp out the bomb bay. Captain Payne reported that his aircraft struck the ground in the English Channel approximately 10 miles west of Trouville and that none of the crew were in the aircraft at that time. (Although the witness, Zuckerman, noted the crash as one mile off shore, Payne noted ten miles off shore). The other gunners reported seeing blood on Swanson’s clothing near his groin, but they did not believe he was badly wounded before he bailed out. They saw his chute come out of its pack, but it did not canopy. It merely trailed behind, apparently caused by cut shrouds. After bailing out, Joe Weaver watched Franklin Swanson pass him on the way down. Swanson was trying to get his chute open as he passed Weaver. Weaver reported that Swanson’s chute was “one long streamer” and that he watched Swanson almost to the ground. Payne’s supposition was that at the time that Swanson was injured, his parachute was also hit by flak causing it to fail to function properly. The Germans provided Swanson’s dog tags and reported him found dead in a nearby woods. The Germans also said they buried him. He was likely buried in a local French cemetery, probably near Trouville-sur-Mer. 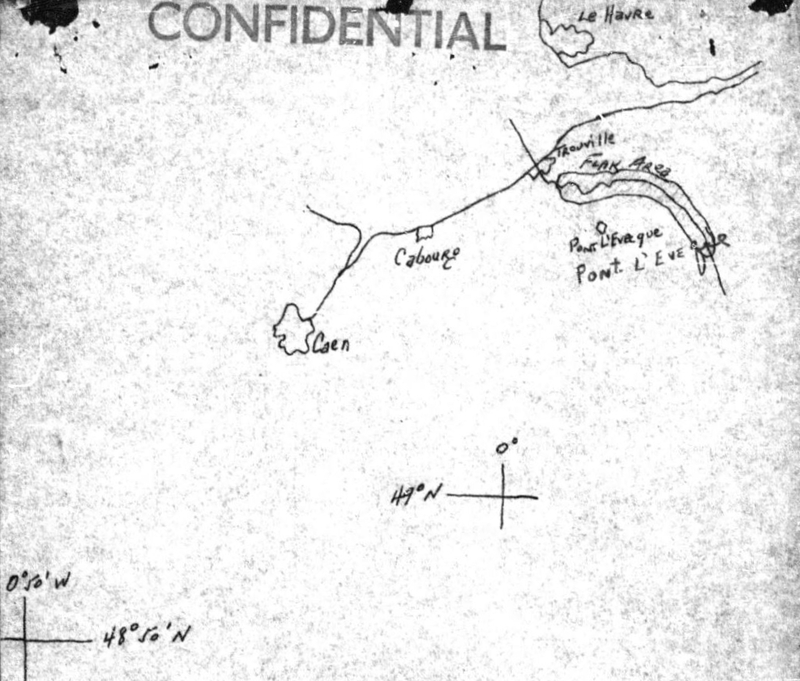 The exact locations of where all of the crew landed are not noted other than Swanson’s body was found “in a nearby woods” and Altvater reported landing in the Channel, having to wade ashore. After enduring six months in Stalag Luft IV and three more months on the road in the Black March, Joseph Donald Weaver was liberated and returned to the US. His formal date of separation from the Army Air Forces was October, 15 1945. Ellen Weaver Hartman would like to find relatives her dad’s crew mates, and especially relatives of Franklin Swanson, the only crew member killed aboard 42-96184 that day. When Ellen’s dad, Joe Weaver, was picking up his gear for the August 6 mission, he didn’t pick up the parachute that he was supposed to get. Instead, he picked up the previous one in the gear line. Franklin Swanson picked up the parachute that was intended for Joe, the chute that didn’t open properly and didn’t deliver him safely to the ground. Joe Weaver was so upset over this that when he was liberated and returned home after the war, he and his parents drove from Mississippi to New York to visit Franklin’s parents. But, probably not considered by Joe was the possibility that the parachute Swanson picked up from the gear line was damaged by flak rather than defective. Sgt. Franklin Swanson was born in 1923. His parents were Charles and Margaret Swanson and he had a younger brother named Carl. They were from Buffalo, Erie County, New York. Franklin enlisted in the Army Air Corps on August 28, 1942 in Buffalo and his service number was 12139321. He was noted, at the time of his enlistment, as being employed in the building of aircraft and also as single, without dependents. He served as an Ap. (airplane) Armorer Gunner with the 386th Bomb Group (Medium), 554th Bomb Squadron in WWII. Franklin Swanson died August 6, 1944. He was awarded the Air Medal with one Oak Leaf Cluster and the Purple Heart. He was re-interred in the Normandy American Cemetery in Colleville-sur-Mer, France, Plot B Row 9 Grave 6. Ellen plans to visit Franklin Swanson’s grave this summer. Ellen Weaver Hartman would like to find the names of the men on which her father, Joseph Donald Weaver, served as an original crew and would also like to find a photo of the crew. Was the pilot of his original crew Robert Fry? Or did Weaver only fly with Fry on training missions? She’d also like to find the exact location where the crew bailed out of the aircraft before it crashed into the channel, and also the places they landed and where Franklin Swanson’s body was found. In sixty seconds after bail out, the plane would have been over the sea, so it must have been very near the coastline, probably within a mile of Trouville-sur-Mer. Ellen would also like to know what happened next. 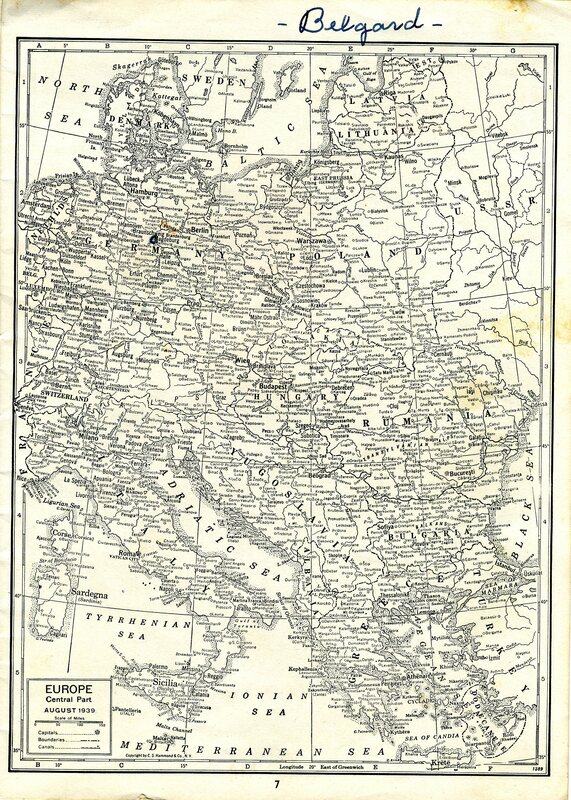 Her dad mentioned going to Chalon, France, and her mother told of a packed train ride to Dusseldorf, Germany. Ellen would like to find more information about Franklin Swanson, pilot instructor Robert G. Fry, and the other men with which her father served in WWII. If any relatives of any of the men mentioned in this article stumble across it, Ellen Weaver Hartman would love to hear from you to learn more about the men her father flew with under pilot Robert Fry (Robert G. Fry, Pierre S. Buckner, Vernon R. Hodges, and John G. Latiloasis), and the men he flew with under pilot Walter Payne (Walter E. Payne, Hubert M. Altvater, Edward William Roggenkamp, William L. Salyer, and Franklin E. Swanson). If you are related to any of these men or have any information for Joe Weaver’s daughter Ellen, please contact her through e-mail using this link: contact Ellen Weaver Hartman. To learn more about the B-26 Marauder, click here.